Note to readers: As this is a transcript, we have preserved the exact original wording, which includes the colloquialisms of the interview subjects at that time. Mr. Sisson was born in the late 1800's, in the farm house which is now a part of the Homestead Cottage Resort. Minnie Sisson was born in London, England and came to Canada in 1905 with her parents when she was very young. Minnie was educated in England, but Leigh attended school in Stanhope. He would walk to Carnarvon to school from late April until September. Leigh recalled school to be, "wonderful - just wonderful." The teacher would organize parties called 'basket socials', to raise money for school purposes or other township funding. The young ladies would bring beautifully adorned baskets of food, and the young men would bid on them. Then the highest bidder would take his girl and partake of her specially prepared meal. Leigh then laughed and said, "If her cooking was good, they could be together "a long time". Leigh's parents, as were most parents of the late 19th century, were kind but strict. Sundays were sacred, and even though Leigh loved to swim in the clear, blue waters of Boshkung Lake, on this day of rest he'd "know better than to say swim, even." 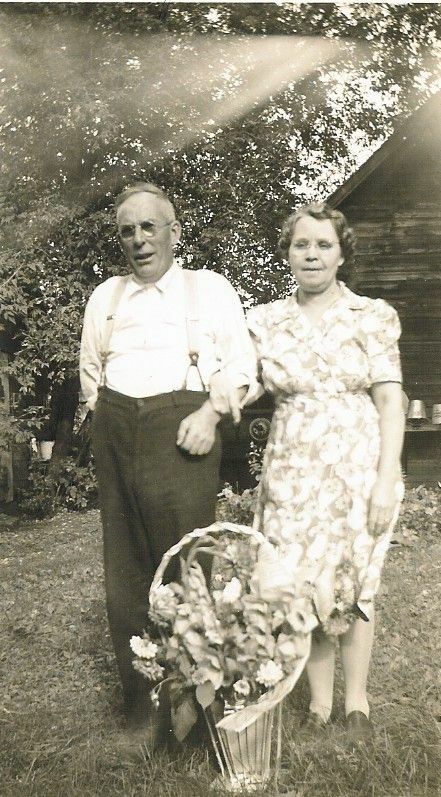 Leigh worked in a lumber camp when he was young, but upon marrying Minnie, in 1919, he stayed at the Homestead (which was then a farm) and worked the land. Minnie was a typical woman of the time, and stayed at home, cooking and cleaning. They had two cabins on their property, and when the tourists started to visit Stanhope in 1920, she would rent them to farm enthusiasts for $10.00 a week, which included home-cooked meals. For extra money, Minnie would rise at 4 a.m. to make butter and to bake bread, which she sold for 10 cents per pound, and 15 cents per loaf. The cost of living was no more or less expensive in 1920 than today, because although prices were lower, their wages were low too. There was no money for frills or petty luxuries, and even if there were, they had to go to Minden to buy them. It was quite odd to discover that cigarettes were once considered a luxury. Leigh never saw a woman smoke until the 1940's, and when asked about alcohol and drugs, he replied, "0h, nothing like that in our day." The only form of entertainment was reading. There was an occasional dance at a person's home, and at Christmas there was always a concert put on by the Church at the schoolhouse. All mail was delivered and collected at Carnarvon, thus requiring a three-mile hike or a three-mile drive in their horse and buggy - they never had a car. The Sisson's closest neighbour was Mr. Oscar Sisson who lived a mile away on the North Shore Road. All residents in Stanhope were helpful and friendly, and even more so in 1921, when the first telephones were installed, connecting fourteen (14) separate households on one line. Their privacy was still enjoyed, and afforded, by the distance between houses. Minnie said, "never wanted neighbours close, until I got older. There were lots of tramps walking along the roads, so I'd like someone close then." According to Leigh, there were also Jews who walked or cycled along the road selling "clothes and things." The people of Stanhope, in the early 1900's, dressed conservatively in home-made clothing. The women wore plain long dresses, and the men wore simple over-alls. Sundays warranted a feathered hat from the ladies, and a jacket from the men. In the 1930's, there was a flu epidemic, and Minnie recalled that everyone was requested to go to Wilf Mason's for immunization shots. There were two doctors at this time; one in Haliburton and one in Minden. The people had to rely on their own resourcefulness to procure an effective remedy for minor illnesses. As Minnie informed us, "You couldn't go to the doctor every minute." The roads were very crude, and only an occasion such as childbirth would necessitate the run to Haliburton or Minden, to employ a doctor's aid. Leigh and Minnie have happy memories of their early life together. When asked what they considered to be the most important aspect of their lives, they replied, "to be alive - just to be alive."